some stunning locales even though you've already seen it in The Beach and that Bond movie with Christopher Lee as the villain. Yes, Mysterious Island should be loads of fun, but ultimately the material isn't really suited to the TV mini-series format as is the case with this show made especially for the Hallmark Channel. It is sort of a sequel to Jules Verne's 20, 000 Leagues Under the Sea featuring a disparate group being stranded on an island inhabited by giant mutated creatures as well as the long lost Nemo (no, not the little fishy from the Pixar movie you dingbat!) who is building an ultimate weapon to end all wars (I suppose it must have made sense at the time). As a brisk 90 minute or even two hour show Mysterious Island would have gone over a lot better, but being stretched out over three hours as is the case here presents a problem. SCREENWRITER # 1: We need some action here. Things are dragging and we need to fill up some running time. SCREENWRITER # 2: I know! Let's have our heroes being attacked by a giant snake! SCREENWRITER # 3: Oh groan, we've already had them being attacked by a giant raven. SCREENWRITER # 1: How about a giant octopus. SCREENWRITER # 3: Groan . . .
SCREENWRITER # 2: No, no, wait. I like it! How about . . .
And so forth. But all these filler scenes get tired and pretty soon one is wondering what other movies Russell Mulcahy has directed after Highlander except for this one . . . THE DISC: We get some short interviews with the director and main cast. Thrown in for good measure are the trailer and a trailer for another Hallmark Channel movie, Supernova. 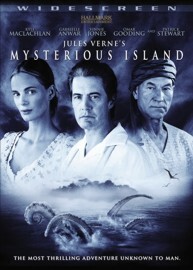 RECOMMENDATION: One probably shouldn't attempt to watch Mysterious Island in one sitting as I did. You?d probably be better off spreading the experience over two evenings in a row instead, which is probably why the DVD is presented in its original two-parter format.